The first order of business at the Litchfield’s original town meeting was to hire a Congregational minister and to levy a tax to pay his salary, The records do not carry a date for this event, but at the November, 1721, meeting, the selection of Reverend Timothy Collins, a Yale graduate, was announced. 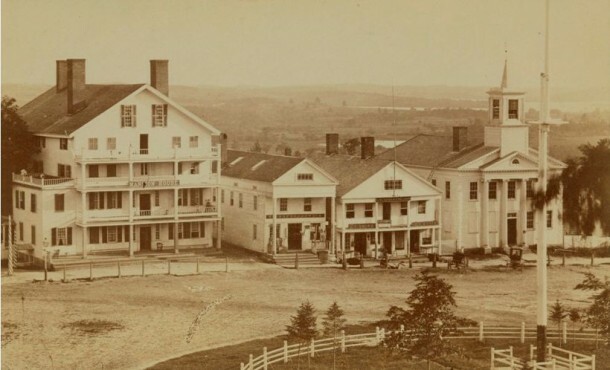 With the setting aside of lands for a meetinghouse and a minister, and the town’s selection of that minister, The New England concept of a town-sponsored Congregational religion had come to Litchfield. It would continue into the 19th Century. Reverend Collins was ordained in 1723. Also that year, it was voted to build a meetinghouse. This structure, completed over a three-year period, was located on the site of the present Center, or Monument, Green. It was an unassuming square structure with a pyramid roof and was, from the beginning, used for both worship and secular activities (town meetings, etc.). 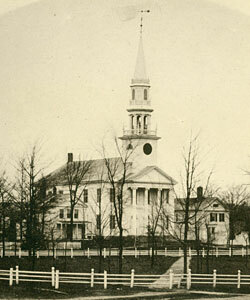 As Litchfield’s population grew and spread out to its perimeters, distances and the hardships involved in “getting to meeting,“ resulted in the Litchfield Congregational Church becoming parent to new Congregational Churches in South Farms (now Morris, CT), Northfield and Milton. Sometime around 1820 the Congregational Church in Connecticut was “disestablished”; that is, it would no longer be supported and governed by its parent towns. Instead, Ecclesiastic Societies were created to oversee the churches secular side. This form of governance persisted here until the mid-1940’s when the church assumed overall responsibility for its own affairs. In 1960, the Litchfield Congregational Church joined with other Protestant denominations to form the United Church of Christ. We have been blessed throughout our long history by outstanding leadership. Following Reverend Collins, 25 distinguished pastors have occupied our meetinghouses’ pulpit and shepherded its flock. Some went on to become college presidents, deans, chaplains and authors. Some appear in the Dictionary of American Biography: one was awarded the French Medal of Honor. Since that fist meetinghouse was erected in the center of the town nearly 300 years ago, there have been four other meetinghouses. The second, built in 1761 for a larger, more sophisticated church membership, was located just north of the first, still in the middle of the road, now East Green. A classic colonial structure, it was modeled after Boston’s Old South Church. The third, built in 1829, on a site just off the green, of Greco-Roman design, it was patterned after meetinghouses in Milford and Southington. The forth, a strikingly Victorian Gothic structure was built on the site of its predecessor in 1873. That predecessor, minus its steeple, was moved around the corner on the Torrington Road and was put to secular use as a recreation center for the town. In 1929 the old meetinghouse was returned to its previous site and resumed its primary function as a place of worship. If you stand on the sidewalk directly in front of the church and look up the facade of the meeting house you will see a Litchfield icon: The First Congregational Church Steeple, now completely repaired, painted and restored. In the steeple is a Seth-Thomas clock, which was a gift to the church from the people of Litchfield in 1929 when the original 1829 meeting house was moved from its location on the Torrington Road to its present site. The mechanical clock now has the original numerals and hands, slightly altered to correct proportions. Both are made of wood and decorated with gold leaf, which varies in the intensity of its glow depending on the place of the sun and the perspective of the onlooker. Careful observers might be able to see a small access door cut into the face of the clock, an original feature, which allows for adjustments and repairs. The clock stands as a symbol of the close ties between the life of the town and the life of the church. It is also a reminder that all of us are mortal, held in the hand of the immortal God of love.